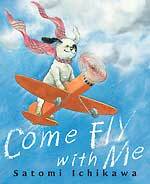 Come Fly With Me was released in March to great reviews, and I read it last week and loved it. Then I got sort of addicted to Satomi Ichikawa and grabbed up every book of hers we had in my branch. I loved them all. My Father’s Shop, La La Rose, The First Bear in Africa!–they were all great. Ichikawa’s stories all involve children or the objects of children’s love (toys, dolls, etc.) having great adventures outside their small worlds. These are great stories to build on the ideas of travel, seeing the world, exploring more than what you know. Becoming worldly, basically. I was really taken with them and thought they would make great read-alouds or books to give as gifts. The stories take place in Paris, an African savanna, Morocco, Luxembourg…I haven’t read all her books yet, but this gives you an idea of the great places kids can discover with these books. They’re really wonderful.